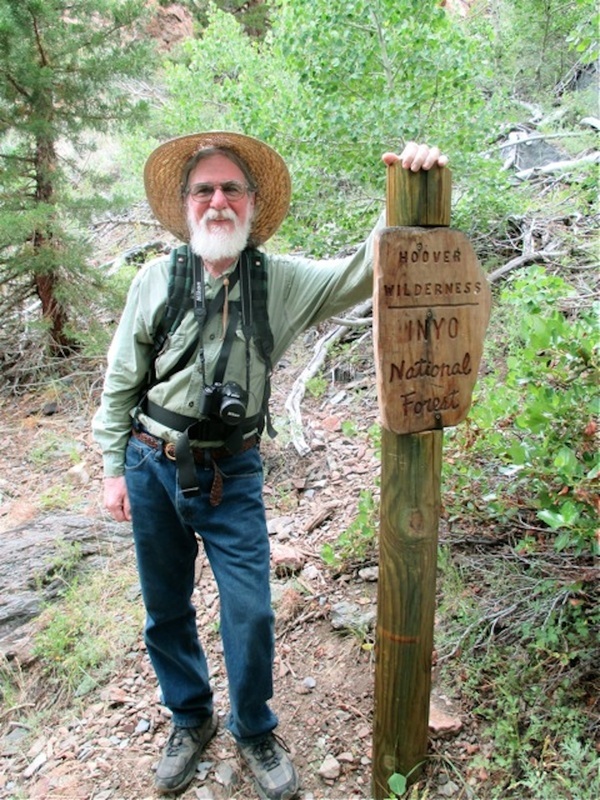 To celebrate the the 50th Anniversary of the Wilderness Act, and to escape from the July 4th bombardment at home, Jean and Michael traveled to the East Sierra and hiked up Lundy Canyon into the Hoover Wilderness. 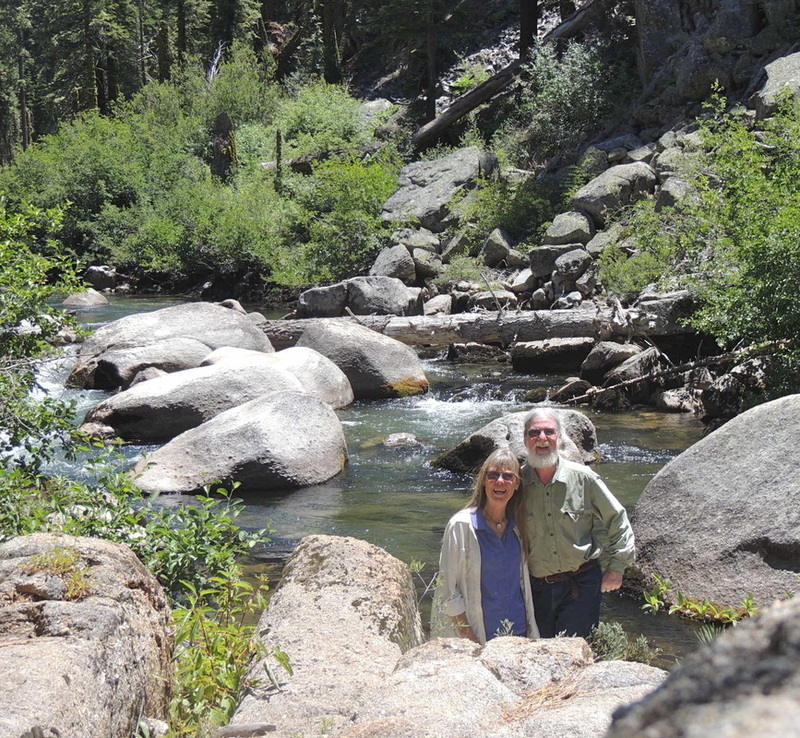 Our trip began with a long drive in a rented car, from Auto World, our locally owned car rental company, from the Central Coast of California, across the Sierra over Sonora Pass. We stopped for our traditional lunch break along the Stanislaus River, still burbling along despite the drought. While the season's snow pack was nearly gone, we spied pockets of snow in high clefts of the rocky peaks, contributing their steady melt of icy water into the waterfalls cascading into the river. Finally on the east side of the Sierra, the Good Side, we wound our way down slope and strike through the spectacular Wolf Creek Valley. We drove on through Bridgeport, eschewing the proffered joys of the rodeo at the edge of town and the overwhelming July 4th festivities dominating the single-track downtown. Just when we felt we'd had enough of our automotive experience, we hauled over the pass and enjoyed the swooping downhill slope above Mono Lake. We cruised past the shoreline diminished by the current drought, up the hill crowned with the Park Service Mono Lake Visitors Center, and with considerable relief, pulled into our regular parking place at Murphy's Motel. After "the usual" (corn on the cob and a baked potato, wine and a beer) at Bodie Mike's Barbecue, next door to the Mono Lake Committee Information Center & Bookstore, we settled into our comfy room. 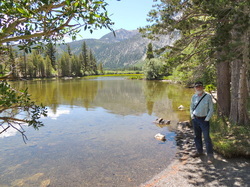 The next morning, after tea and scrumptious cheesy Pepperoncini scrambled eggs, and a bit of cyberfrustration, we drove south to Mammoth to attend the Wilderness Act 50th Anniversary celebration at Mammoth Creek park at the edge of town. 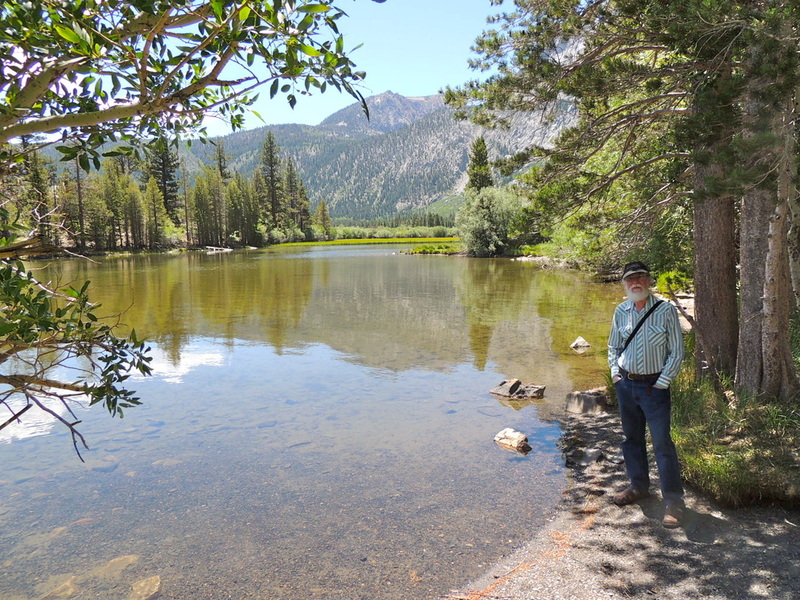 We took the June Lake Loop off of 395 for a welcome turn through glacial country and the series of three lakes, Grant Lake, Silver Lake, Gull Lake and June Lake, with all their attendant 4th of July holiday activities. That evening, we enjoyed a home cooked feast in our kitchenette at Murphy's Motel, and went to bed early, anticipating our personal celebration of the Wilderness Act the next day. 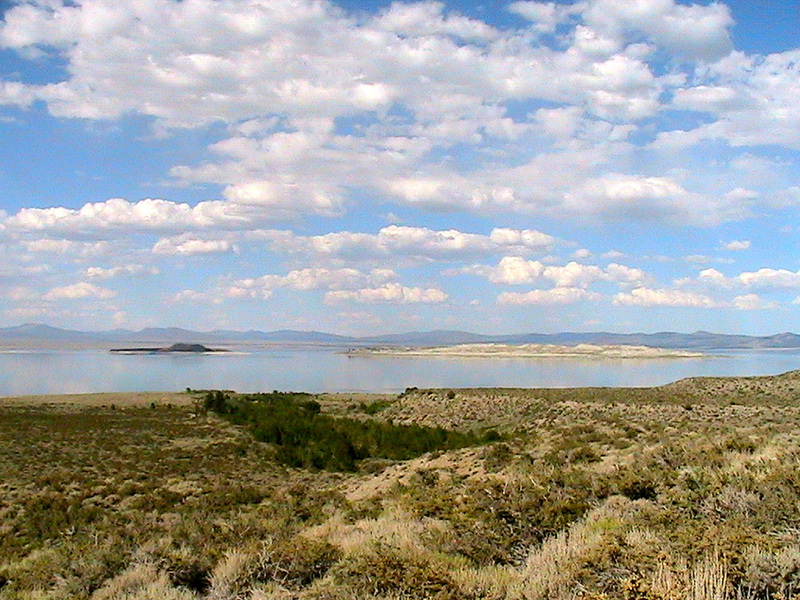 After breakfast and a catch-up on the world's depressing news, we packed up and drove to Lundy Lake and the hanging canyon that peers out over Mono Lake. Lundy Canyon Trail is three miles of easy walking, rock scrambling, history and archaeology, waterfalls, and, this time of year, abundant wildflowers. About half-way to the upper falls we entered the Hoover Wilderness, our celebratory destination. Mere words can't describe the experience of hiking through wilderness. The following pictures and videos will give you some idea of the memories we carried with us out of the Hoover Wilderness. Hover over the picture below and click "PLAY" to see the slide show. For a flavor of the sights and sounds of Lundy Canyon, we experimented with the video feature of our new digital cameras. Spielberg need not fear at this point, but next year...! We paused at the upper falls for a scan around the cirque that forms the high end of Lundy Canyon. Waterfalls descend on every quarter. Even though this is the height of a drought, there's plenty of water here for the canyon life. We were amazed at how green it was up the canyon walls and the profusion of wildflowers everywhere. From here a steep switchback trail climbs up out of the canyon, across a scree field and up into the Twenty Lakes area of Yosemite National Park. 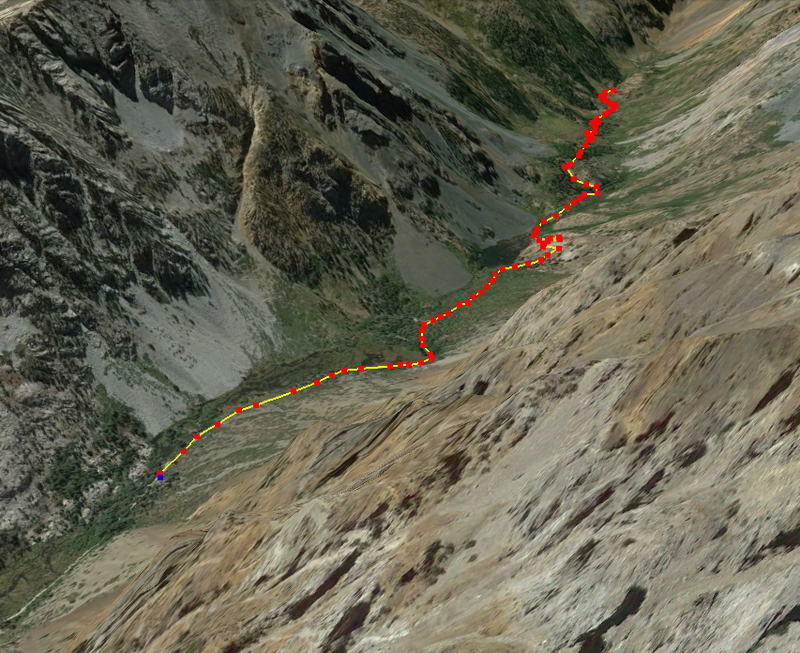 We passed on that experience this year, saving it for next year's hike up Lundy Canyon. We walked quickly downslope, past the falls, the beaver dams and finally back to our car and the trip back to Lee Vining, our load lightened by the memories of this very special place.